Casa Fernando est une villa moderne et lumineuse et spacieuse, un excellent choix pour une maison de vacances confortable dans un emplacement très pratique. Douche / WC au niveau du sol. Salle de bain complète au premier niveau. Wir verbrachten bereits einige Urlaube in Porto Petro. Wir lieben diesen Urlaubsort, in dem es nicht von Touristen wimmelt, wegen seiner ursprünglichen und eigentlich familiären Art. Das Casa Fernando, welches wir zum ersten Mal buchten, stellte alle unsere bisherigen Feriendomizile, mit denen wir auch ausnahmslos zufrieden waren, in den Schatten. Zum einen sticht es architektonisch heraus. Zum anderen ist die Ausstattung hochwertig, es fehlt wirklich an nichts.Der Pool ist mit 8 x 4,50 m sehr groß und mit einer Tiefe von 1,10 bis 1,70 m und wenig gechlortem Wasser ebenfalls ein Highlight. Auf der Terrasse ist man von viel Grün umgeben. Das Casa Fernando liegt in ruhiger Lage am Ortsrand und man erreicht die wirklich qualitativ guten Lokale am kleinen aber feinen Yachthafen von Porto Petro fußläufig in 5 Minuten. Der E-Mail Kontakt zur Vermieterin im Vorfeld war ebenfalls sehr angenehm. Wir haben ein Traumhaus gefunden und werden garantiert wiederkommen. We had the best family (x2 adults, x2 children 15 and 7) holiday at Casa Fernando and cannot wait to go back! The villa exceeded all our expectations even after reading all the glowing reviews. 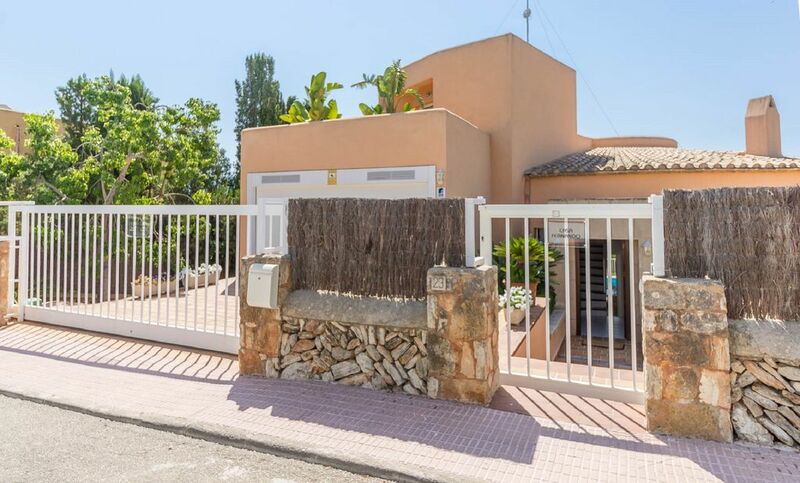 Casa Fernando is perfectly situated in a beautiful little town that has a number of lovely restaurants and a couple of small supermarkets all within walking distance. There is also a beach within easy walking distance. The villa itself is spacious and modern and is the best equipped villa we have ever stayed in. The pool is much larger than most villas of this size and the gardens were a lovely surprise. If you are looking for a quiet, restful holiday with beautiful surroundings, I highly recommend Casa Fernando. Absolut ruhig gelegen, wir waren hier wunschlos glücklich- waren in der Villa schon vor 10 Jahren gewesen - und werden bestimmt wiederkommen! We are glad you enjoyed your stay and we hope to have you again soon! Villa Fernando is a beautiful and very comfortable villa. We had a lovely surprise on arriving at villa fernando. Much nicer than sites photos. Very well equipped. A wonderful large pool. The most comfortable beds I've ever slept on. The host was very helpful in answering any questions/queries. We were very impressed by the Villa and thoroughly enjoyed our stay. Porto Petro is a lovely town, which although developed, has not been changed beyond recognition by tourism. There are some lovely small beaches to visit and being to close to the National Park there were still plenty of trees and landscape to enjoy. The port had some good restaurants and we can particularly recommend Cella 9. Although it is best to book in advance. We hired canoes too and had a fun time in the bay visiting the boats and beaches round the corner. The villa is very well equipped and unlike some we have visited, the aircon in the bedrooms is effective and quiet at night. It has lots of lovely different seating areas and the pool is wonderfully accessible from the back. The owners were also very helpful and well organised with nice touches to make your stay a good one. I would definitely recommend this as a location and we will certainly hope to go back. Thank you! Re packing note that pool towels are provided as well as bath towels and there are hair driers in the bathrooms. There is also a good collection of paperbacks in English and a few in German at the villa. Il ya une école de plongée à Porto Petro. L'aéroport de Palma de Majorque est à 55 km, à 45 minutes en voiture. Les boutiques et les restaurants les plus proches sont à Porto Petro, à 5 minutes à pied de la villa. Cala D'or, une station plus animée, est à seulement 5 km. une façon. Booking Notes: Please email to make a reservation and check availability. 25% of the total rental price payable at booking, non-refundable in case of cancellation, and balance 8 weeks before departure. 250€ security deposit. Changeover Day: Please contact owner.